Photo courtesy of Sarah Traiger. Kim Powell replaces tubes on a sediment trap to measure silt in Kachemak Bay. Old-timers will tell you that, back in the day, the glaciers of Kachemak Bay stretched across far more domain than now. Today, many are receding at a rapid rate, in pace with large ice fields worldwide said to be responding to temperature increases. The increased glacier silt from all that melting ice is causing problems for at least one species in Kachemak Bay — kelp. 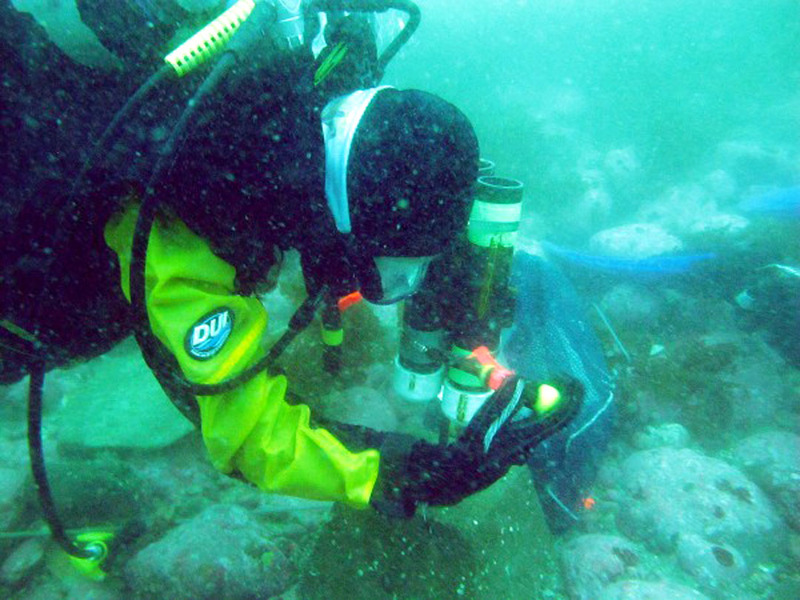 A recent study by the University of Alaska Fairbanks found that increased silt may be making it difficult for kelp to attach to underwater rocks. In addition, the silt in the water may be blocking sunlight to the bottom layers of the bay, limiting kelp’s ability to photosynthesize. Brenda Konar, a professor at the University of Alaska Fairbanks School of Fisheries and Ocean Sciences, is working with doctoral student Sarah Traiger to study the effects of glacier melt on kelp reproductive cells’ ability to travel, settle and grow in Kachemak Bay. The Harding Icefield has shrunk by 3 percent over the past 16 years, the National Park Service reports, resulting in more glacial silt in the water. “As glaciers on the Harding Icefield continue to melt, we need to understand how communities and ecosystems are likely to change,” Konar said. Photo by Joseph Robertia, Redoubt Reporter. A visit from a male grosbeak can lead kids down the path of curiosity and care for their environment. Human beings, possibly above all else, excel at being absorbed in themselves and the minutiae of their lives. It’s a habit I’ve worked hard to ensure doesn’t become instilled in my daughter, and not just because I’ve always preferred national parks over theme parks, but so that she understands there is another world beyond the din of our society’s increasingly urban lifestyles. As part of creating an awareness and appreciation of this world, starting with the wild places near home, we started taking daily nature walks before she could walk. Now, nearly 3 years old, she wouldn’t let me miss one of our field forays even if I wanted to. 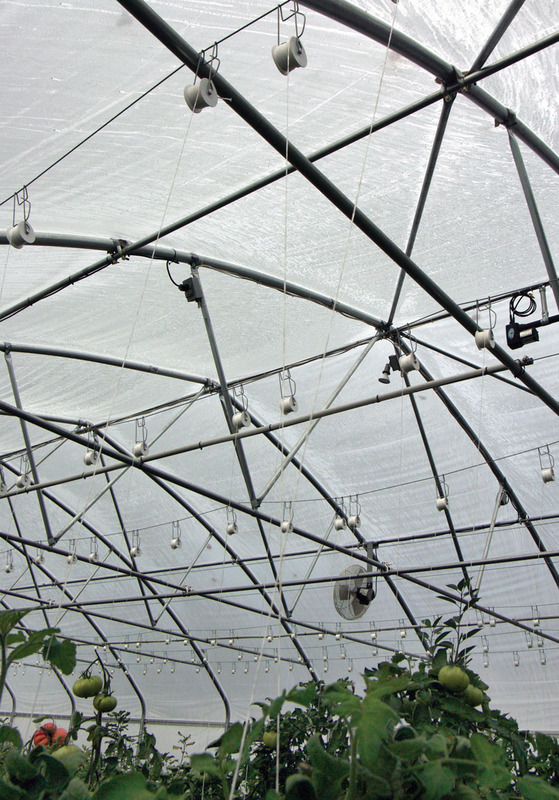 We go regardless of weather, because there is always something to be seen and learned, even in inclement conditions. We follow trails left by moose, collect treasures like tiny spruce cones or unusually shaped stones or pick berries and mushrooms when they’re in season (only after I’ve identified them as safe.) All these capture my daughter’s attention, but of all her favorite outdoor activities, few compete with the curiosity she holds for the birds that visit our feeders. All of it seems to enchant her — from the careful selection of on which branch a chickadee will wait while awaiting its turn to claim a sunflower seed, to the nuances of where a nuthatch chooses to cache its cherished meal and, especially, any new avian arrivals. A small flock of grosbeaks flew in. Hardly a life-list species for most birders, but its year-round commonness in the boreal forests of Alaska didn’t make the sighting any less spectacular to my daughter. They’re a beautiful and charismatic bird, quite large and plump for a member of the finch family, and with a stubby bill. The males have a chokecherry-red back, breast and head, even in winter, which is what caught our eyes in a seasonal world of white and various hues of blue. The females are more grayish with a bit of olive coloring to their heads and rumps. Grosbeaks are tame by wild bird standards, not easily perturbed by human movement, but I still steadied my daughter by placing my hands on her shoulders, since the birds landed mere yards from where we were standing. We froze, still as statues and silent enough to hear the natural wind chime of the last few dried leaves still clinging to branches above blowing in the gentle breeze. The grosbeaks flitted on the ground around us, sorting still-good seeds from empty hulls under the feeders. Through my palms I felt my daughter’s pulse increase as her wonder-filled heart picked up pace from the exciting spectacle. Time pooled in the present as we stared, completely in the spell of these birds, until — as toddlers are wont to do — my daughter finally broke the silence to ask a question. At the sound, the birds flushed before the first word completely left her tiny lips. It was an ephemeral experience to witness that she clearly thought about for weeks afterward, as evident by the litany of questions that followed, which I used as teachable moments. When she wondered aloud where the grosbeaks were in the following days, I asked her questions, not just about the birds themselves, but the world they live in. Why had they been there at that time of day? Where did she think they were before we saw them, and where did they fly next? What were they eating when not at our feeder? Did they have friends and families? Did they have enemies, such as predators? To be sure, even I didn’t know the answers to some of the questions I posed, but that wasn’t the point. The goal was to stimulate her brain, to get her to think about what she will one day learn to call an ecosystem. 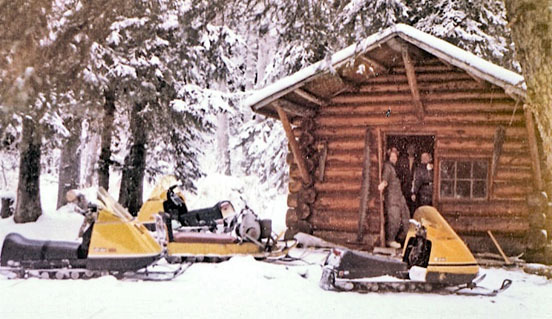 We could have stayed indoors by the warmth of the woodstove, reading books to learn about the world rather than from it. Likely the same folks who don’t get any more specific than lumping everything with wings into “birds,” and everything with bark and trunks into “woods.” But for me, as someone who enjoys identifying a grosbeak as well as noticing it in an isolated stand of cottonwoods mixed into a sea of spruce, it’s my belief that knowing these details adds to the texture and delight of the encounter. And I hope to pass this acknowledgement and appreciation of the nuances of nature on to my daughter. 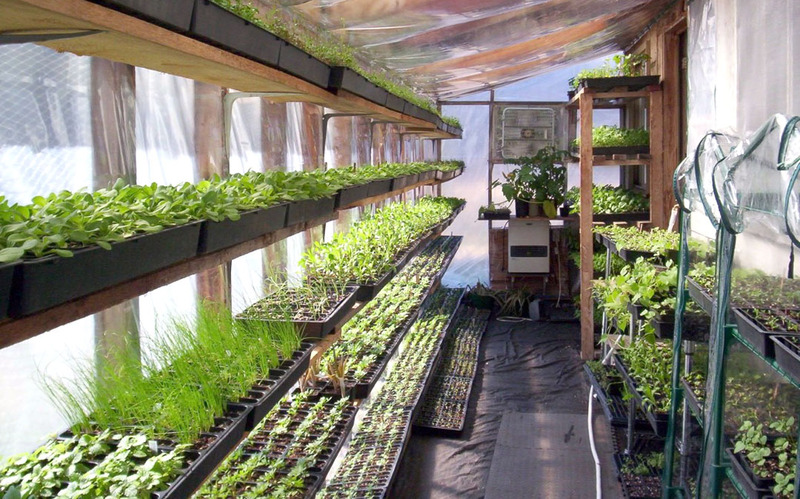 In the future, she and the rest of her generation will face many complex issues, from climate change to protecting endangered species, shifting food-production methods to feed the ever-growing global population, and myriad more. But the first step to raising adults who believe in stewardship enough to attempt to solve these nature-related problems must first come from encouraging children to be in nature. To think globally, they must first learn to care locally. Like Henry David Thoreau once said, “The more slowly trees grow at first, the sounder they are at the core.” I hope my daughter will remember, as an adult, down to her core, the sights of the birds and other creatures she sees daily, remember the sounds of their whistles and warbles, and remember to care about them and protect their wild habitats. Perhaps, one day, she’ll then share her interests and concerns for the natural world with her own children. Joseph Robertia is a freelance writer living in Kasilof with his wife, Colleen, and daughter, Lynx. He and Colleen operate Rouges Gallery Kennel. Photo by Joseph Robertia, Redoubt Reporter. 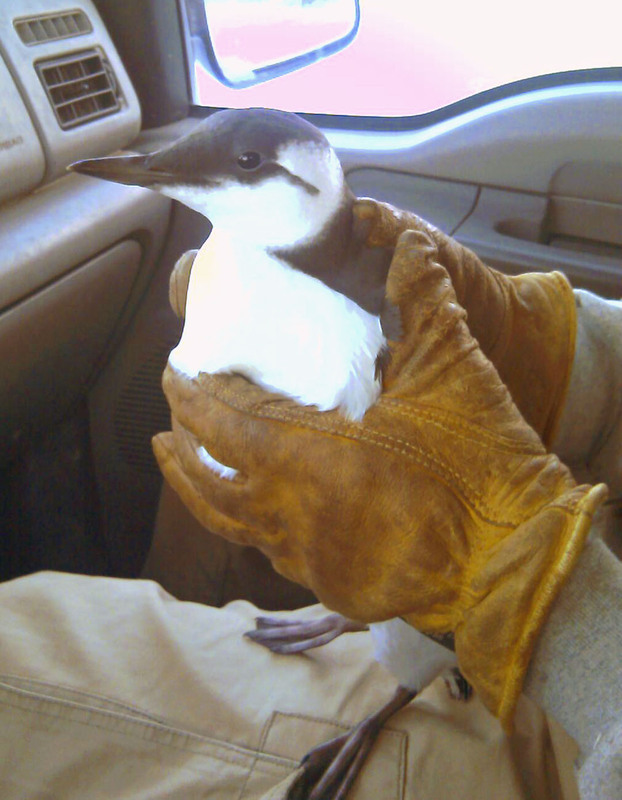 A murre, found inland in the Kasilof area last week, is one of many seabirds that have been turning up in unusual spots throughout Southcentral Alaska and along the coast of the Pacific Northwest. Scientist are uncertain what is causing the strandings. 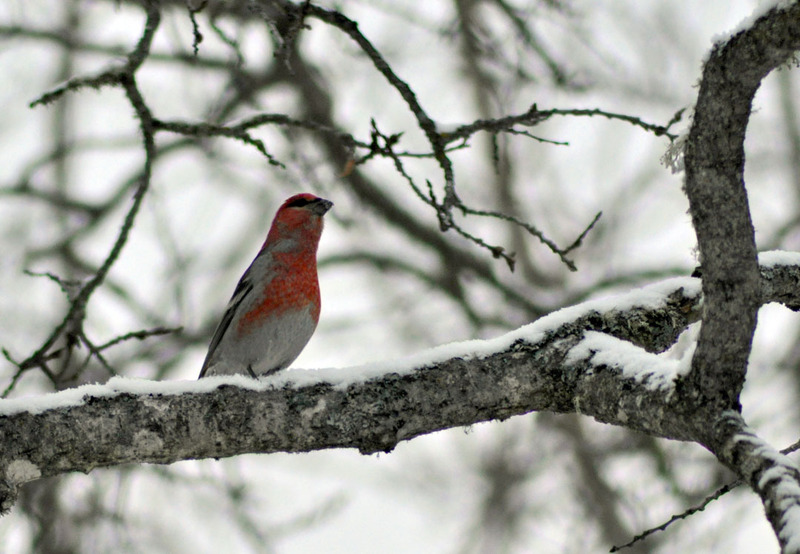 Winter isn’t typically a busy time for bird-watching on the Kenai Peninsula, but unusual sightings have put birdwatchers on alert. Common murres are making uncommon appearances around Alaska. The seabirds are showing up inland and in poor condition. “I got three over the weekend, spread throughout the Beaver Loop area, all at different houses, all thin and not very strong. I lost one, but I’m feeding the other two, trying to get them stronger,” said Marianne Clark, a licensed wildlife rehabilitator. The medium-size birds with black heads and backs and white bellies, look like a cross between a loon and a penguin. They have long, thin beaks for feeding on fish in the saltwater where they typically spend their winters. But this year, they’re showing up inland. “We don’t know a lot at this point, just that there is an influx of them coming in. We took in 20 from Oct. 31 through Nov. 12,” said Katie Middlebrook, an avian rehabilitation coordinator at the Bird Treatment and Learning Center in Anchorage. “Most have come in from Anchorage, Wasilla, Palmer, even one as far as Talkeetna — strange places for murres. You’d usually see them washing ashore in Homer and Seward,” Middlebrook added. And they have there, as well. “The Alaska SeaLife Center has received about 25 common murres over the past two weeks, all from the local Seward area. Most of the birds have been found inland, which is not where you would expect to find this type of seabird,” said Tara Riemer, president and CEO of the Alaska SeaLife Center. Riemer said that the birds have been thin but alert, so after feeding and rehabbing them back to full strength, the center has released several of the birds in appropriate waters nearby. “We have been doing a brief exam on the birds, but no necropsies. Some of the birds have been screened for avian influenza, but laboratory results will not be available for some time,” she said. Riemer said that murre numbers are still high. “Even so, we are keeping in touch with regional and national U.S. Fish and Wildlife Service and U.S. Geological Survey staff to share observations,” she said. 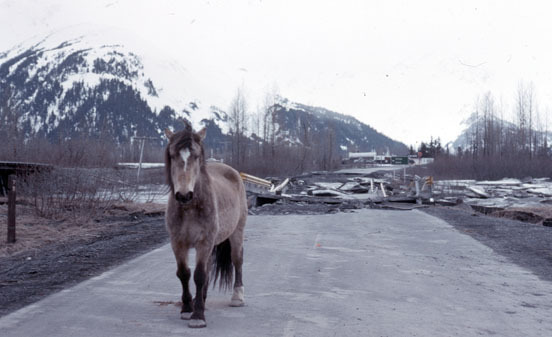 Photos by Joseph Robertia, Redoubt Reporter. 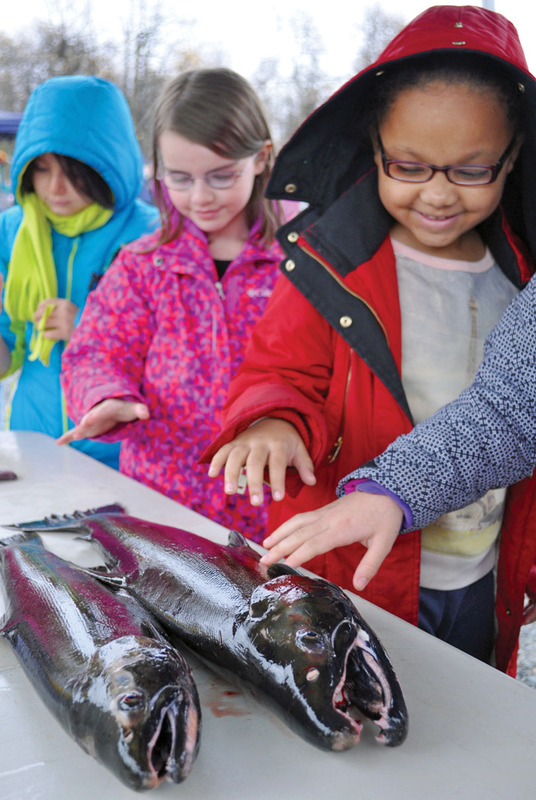 Addison Havrilla, a third grader from Kalifornsky Beach Elementary School, touches a coho salmon during the annual “egg-take,” which took place along the bank of Bear Creek near Seward last Tuesday and the Anchor River last Wednesday. The events were part of the “Salmon in the Classroom” program, presented by the Alaska Department of Fish and Game’s Aquatic Education program and the Kenai Peninsula School. “Why don’t salmon have eyelids?” It may sound like the start of a joke but was a real question, one of many asked and answered during this year’s Salmon in the Classroom program, presented by the Alaska Department of Fish and Game’s Aquatic Education program and the Kenai Peninsula School District. The program took place along the banks of Bear Creek near Seward on Oct. 6 and the Anchor River on Oct. 7. For the record, the answer is because they live in a liquid environment, so their eyes don’t dry out. That’s a concept some of the students participating had never considered, which is partially the point of the program — to get kids thinking about the aquatic animals that many have spent their lives around, yet never really learned the basics about. 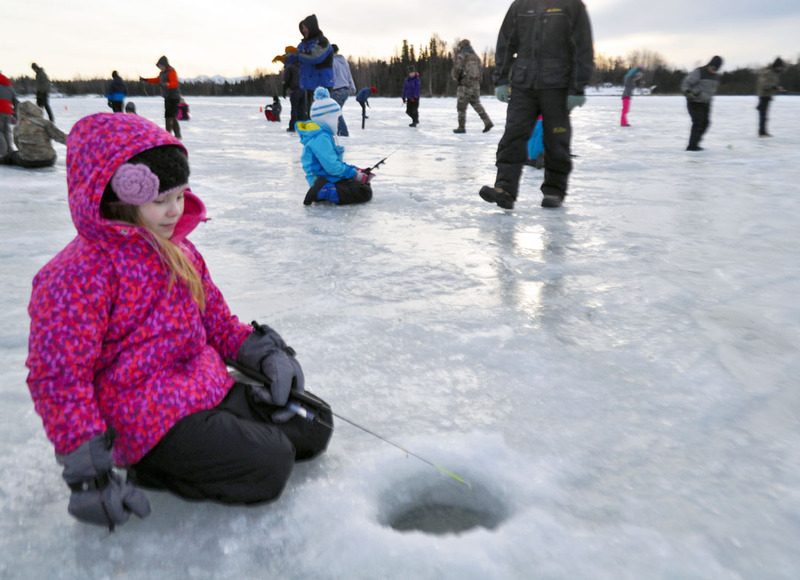 “It’s cute some of the things that they think and say when we start going over salmon identification, biology, life cycles and habitat requirements,” said Jenny Cope, a Fish and Game sportfish biologist from the Soldotna office. 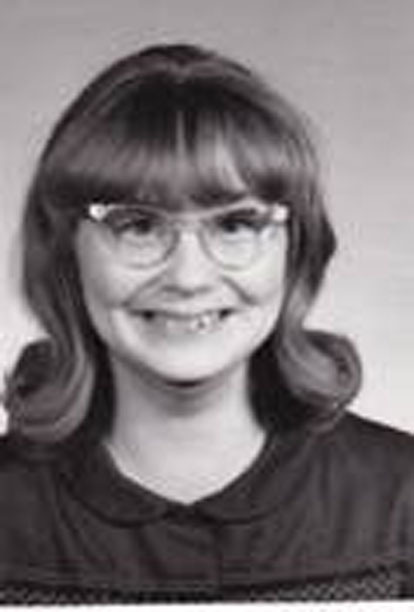 During the course of the two-day egg take, Cope said that she hears just about every question imaginable, this year from about 300 students at Bear Creek and 400 at the Anchor River, as well as some reasonably well-thought-out, though still incorrect, answers to her own queries. “No, it’s not fertilizer the male puts on the eggs,” she said at the Anchor Point location. “No, it’s milt with a ‘T,’ not milk that comes out of the males,” she corrected another. “Yes, there is a king salmon, but no, there is no queen salmon,” she added later. While the kids were a little unclear how it all worked at the beginning of the day, seeing — and for a lucky few students — feeling how the process of salmon egg fertilization works became as clear as crystal creek water. “We hope that this is memorable for them,” Cope said. What wouldn’t be memorable about seeing a plump-bellied, ripe and ready-to-spawn female coho salmon sliced open and her thousands of fluorescent pink eggs plopped into a clear plastic bucket, followed by a crimson-colored male fish massaged down his large abdomen until he squirts a creamy stream of milt onto the eggs. Opponents and supporters of the proposed Chuitna Mine on the west side of Cook Inlet both found something to oppose and support in a mixed decision issued Oct. 7 by the Alaska Department of Natural Resources. DNR announced its ruling on applications for in-stream flow reservations on Middle Creek, a salmon-bearing tributary of the Chuitna River, filed by the Chuitna Citizens Coalition. Water reservations ensure that stream flows remain sufficient for fish habitat. DNR granted the coalition’s reservation application for the lower reach of the stream, outside the proposed mine’s boundaries, but denied the requests for the upper and middle sections, where Delaware-based PacRim proposes strip-mining for coal, most of which would be exported to Asia. Representatives of PacRim and the landowner of the proposed mine site, the Alaska Mental Health Trust Authority, expressed disappointment that DNR allowed any of the applications, and concern that a reservation was granted to private citizens. 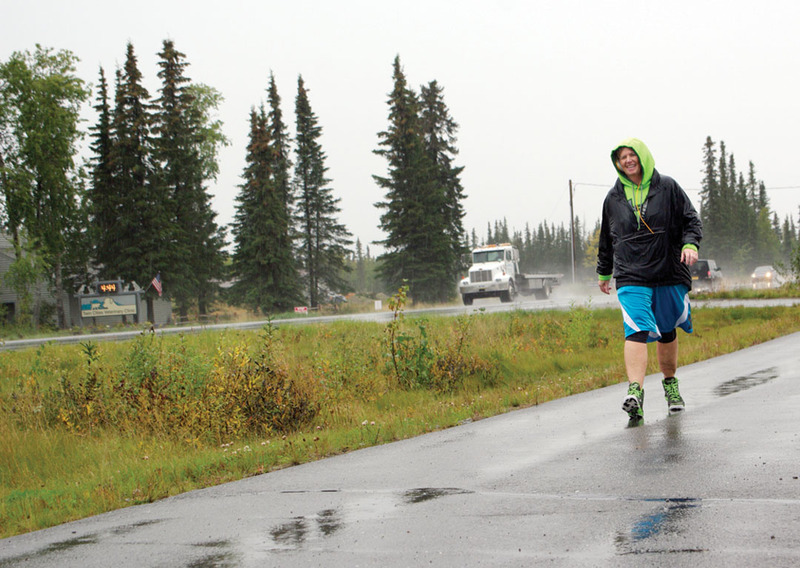 Water reservations in Alaska have only ever been granted to agencies before now. Meanwhile, opponents of the proposed mine celebrated the precedent of the state granting a water reservation to private citizens. But Bob Shavelson, of Cook Inletkeeper, took DNR and Gov. Bill Walker’s administration to task for not approving all three applications. 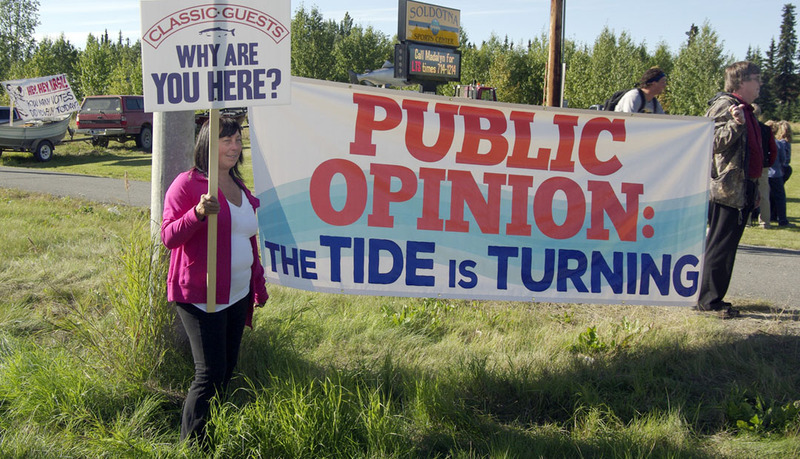 Photos by Jenny Neyman, Redoubt Reporter Demonstrators protesting the Kenai River Sportfishing Association met outside the Soldotna Sports Complex on Thursday evening while participants of the Kenai River Classic held a banquet inside. Protesters also floated with signs outside the riverfront home of founding KRSA member Bob Penney during another Classic event Aug. 19. The hundred or so people holding signs outside the Soldotna Sports Complex on Thursday afternoon were demonstrating their opposition to the Kenai River Sportfishing Association, which was holding a banquet inside as part of its annual Kenai River Classic fundraiser. But their message wasn’t directed at KRSA. Neither were the similar signs displayed by eight boats and a kayak in front of the riverside home of KRSA founding member Bob Penney on Wednesday evening during another Classic event. They hoped to reach community members — there were some honks and waves as cars drove by — who might not give fish politics much thought unless an issue is jumping up and wriggling in their face. And they particularly wanted to reach KRSA’s guests — the business executives, industry representatives, politicians and others who come to fish in the Classic and support KRSA with their donations. Participants included private sport anglers, personal-use fishermen and some who don’t even fish much at all. No sportfishing guides were in attendance. Most of the participants had a commercial fishing interest. “There’s no doubt about it there’s a fair number of commercial fishermen here. It may be the majority. But the Kenai Area Fisherman’s Coalition has no commercial fishermen on their board of directors and they organized this, so they’re getting support from a broad spectrum of people,” said Ken Tarbox, also a retired Fish and Game biologist. Megan Smith is all of the above. Demonstrators’ signs ranged from the obvious — Kenai River Sportfishing Association with a circle and over it — to more nuanced, the variety of messages speaking to the multiple complaints that motivated demonstrators to participate. “Support Diverse Fisheries” and “We Support Our Set-Netters” references a ballot initiative to ban set nets in urban parts of Alaska — which primarily would gut commercial fishing in Cook Inlet, where there were over 730 active set-net permits in 2015.